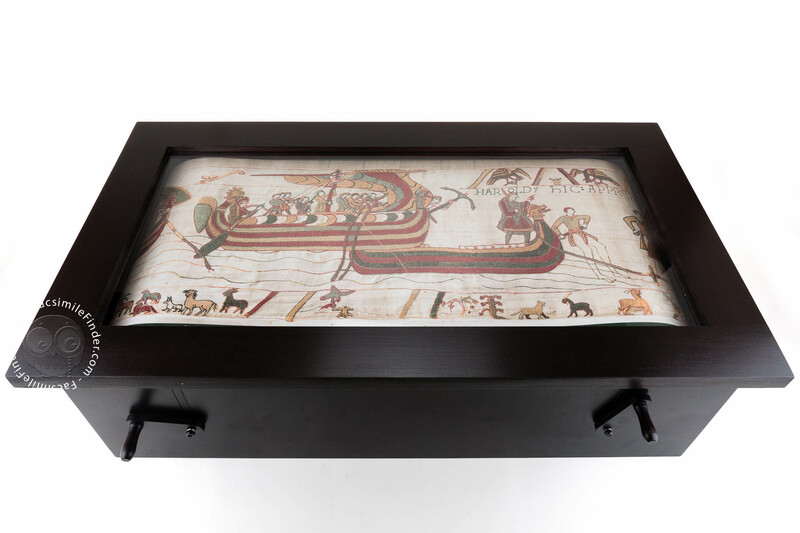 accessible to libraries and private collectors, the facsimile reproduces the whole cloth in a reduced format (60% of the actual size) and it’s placed in an ingenious wooden display box which allows you to scroll it by handles. The Bayeux Tapestry, also known as Tapisserie de Bayeux, is a beautiful example of skillfully embroidered cloth preserved in the town of Bayeux, Normandy, France. The tapestry, taking its name after the French town, was probably produced in England, and unfortunately, the exact date remains unclear. The tapestry tells the events that took place between 1064-1066, ending with the battle of Hastings. The two main protagonists are Harold Godwinson, King of England and William, Duke of Normandy, also known as William the Conqueror.